It was 5 in the morning when I felt my first labor pain. The doctor told me it would feel like menstrual cramps, but I had never before had a menstrual cramp. I guess this is what it felt like. My sleeping boyfriend, Randy, lay unmoveable, so I decided to go back to sleep. It was no use; I was too excited. After all, in the days before ultrasound was used as regularly as a thermometer, I was woefully uninformed about a lot of things: Is the baby okay? Is it a boy or a girl? Will it be safe to deliver naturally? 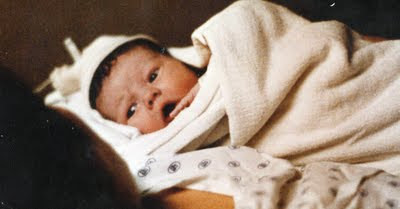 Those morning hours on the 8th of April, 1985 were spent in strange pain and discomfort, and I finally surrendered and went to the hospital where I was to deliver this little person. Methodist Hospital in Sacramento was about a five minute drive from the home we shared with Randy’s family. I stayed there at the house, with the permission of his mother, Dorothy, and with the blessing of his sister, Cindy. Because of my juxtaposition to Randy’s ex-girlfriend, with whom he had his first son, Nickelous, Dorothy made the occasional mistake of calling me by her name: Karen. That morning was no different. “Good Luck, Karen,” she said as I was leaving. In pain, and in labor was nothing compared to being mistaken for Randy’s ex. I would be Randy’s “new girlfriend” – even after a year. I arrived at the hospital and went straight to maternity. I had them call my doctor, only to find that it was his day off. The Doctor standing in, Dr. Starkes, was someone who I was unfamiliar with, but who turned out to be incredible. The nurses who prepped me for “labor and delivery” strapped a belt around the biggest part of my belly and told me that I was a special case: a test patient for a new thing called a fetal monitor. While I was uncomfortable and in pain (that seemed to just be getting worse) the nurses had an in-service in my room. Their lesson was on technology, and they all were watching this newfangled thing make a tape that told them the state of the baby and the intensity of my contractions. I wished they’d leave, and they finally did. Randy smoked a ton of cigarettes, nervously, and many times my sister-in-law (my name for her), Cindy, took his place comforting me. At 5 o’clock there was no comfort that I could get from anything. I screamed and hollered for mercy...and finally got it in a shot, called Visterol. In the quiet of the no-pain zone, I reflected on my life. I was raised well, but rebelled at every turn. I finally moved in with my drug dealer whom I fell deeply in love with. I found out soon that he loved drugs much more that I did, but couldn’t extricate myself from the relationship because... I loved him. One thing led to another and I became pregnant. Pregnancy made me lay my drug habit down – I had to. What I later learned is that I was not clean and sober. I was just dry. A life without drugs is not the same thing for an addict as sobriety. Sobriety is a clean life where you deal with your problems one by one. You live in a reality that is shared with others, where you are forced to acknowledge that you have damaged a lot of people besides yourself. When possible, you apologize, or make amends to those you’ve hurt. Sobriety is one day at a time, and usually acknowledges a “higher power” or GOD as the one who is in control. There, on the bed where I would eventually deliver my baby, I was terrified. Where was God? Who was He? I knew my Catholic upbringing gave me encyclopaedic answers for this stuff, but it wasn’t much more than knowledge. I knew He was there, but I also knew I was bad. The bad girl. The girl who became addicted to meth and blew it with her parents and never would have hope of having any decent life. I would be the girl who would screw up the birth of her own baby - the hardest cross I would bear. A baby born to suffering...for my mistakes. Rushed to an incubator to have its sweet little DNA analyzed to see what had gone wrong. Instead, of all of my fears, the wee morning hourse of April 9th brought forth a little baby boy who came out...perfect. “It’s a BOY! !” the doctor shouted through his mask. He placed the little baby on my tummy, while he cut the cord. It was then I saw Vincent’s face for the first time. He lifted up his head, and looked into my eyes. His were deep blue, and through the slick film of birth, he looked at me. I was in love. Then, something wonderful and strange happened. He anchored himself on my tummy, raised himself up on his hands (like a tree-frog) and lifted his head. A large, black nurse laughed and shrieked “Look at that baby!! Look at that baby! !” I couldn’t believe it. “Is this normal?” I asked, as I watched Vince look around. “Hardly,” the doctor answered, finishing off the stitches. It was a joy to see: that not only was my baby healthy: he was beautiful and strong. After a bath and a blanket, the nurses rolled me out the doors, cradling him. As we went into the hall, Dorothy and Cindy were there, expecting news. “It’s a boy! !” I shouted, forgetting that I was holding a baby. Cindy, with her omnipresent camera came over and snapped a lot of shots, one of which shows Vincent reaching over his receiving blanket and trying to touch my face. So. That was twenty six years ago. My face, my body, my memories have all accumulated what they are supposed to. I am 48. That day I had Vince I was younger than he is today: 22. On that day, God showed me that He was not only in control, but that He was full of grace. Full of Grace. Beyond my heart, beyond my expectations, I deserved nothing less that total disaster. Instead, he gave me a masterpiece. Today, Vince is a man. We connect the same way we did the day he was born: beyond what is normal. I love him tremendously, and say that he saved my life. After having him, reality came quickly and I welcomed it. His life made mine better, and I pray that he can say the same. Thank you, Lord. Happy Birthday, Vince.